The Wild and Exotic Animal Medicine Society (WEAMS) is a non-profit organization operated by student volunteers at the Western College of Veterinary Medicine (WCVM) and together with the WCVM Veterinary Medical Centre, they provide care for injured wildlife and exotic animals. Just as last year, I've volunteered a bit of my time to photograph of a few charismatic patients who received treatment at some point during the past few months - everything from a mischievous muskrat to an incredibly regal golden eagle. Hopefully these stories help convey just how much hard work and dedication goes into rehabilitating these animals, as well as how vulnerable they truly are. If you're in Saskatoon and are interested in supporting this outstanding organization and would enjoy a different feathered - or furry face each month, calendars are available at Wild Birds Unlimited on 8th Street. Larietta the golden eagle was found as a juvenile, unable to fly and in poor body condition suggesting she wasn’t eating. On arrival at the WCVM Veterinary Medical Centre she was very weak and suspected to be suffering from West Nile Virus. She was placed in the care of WEAMS where she made a complete recovery and even provided a blood transfusion to a great horned owl patient. One of the largest, fastest and nimblest raptors of North America - the golden eagle is a fearsome predator. They typically hunt rabbits, hares, ground squirrels and prairie dogs, however they’re also able to prey upon relatively large animals, such as cranes, wild ungulates and domestic livestock. As their primary prey species don’t usually ingest pesticides, the golden eagle was lucky to avoid the harmful impacts of DDT and other egg thinning chemicals prior to their ban in the 1980’s. However, they’ve faced occasional persecution from ranchers fearing the eagles would prey on their livestock. Golden eagles are monogamous and may stay with their mate for many years or even for life - while nesting, pairs will actively defend territories upwards of 150 square kilometres. Latte, a male great horned owl, was admitted to the WCVM Veterinary Medical Centre after being discovered laying on a grid road. On arrival he was extremely very weak, anemic and showed evidence of inflammation in his bloodwork, indicating potential sepsis. He perked up with antibiotic treatment and a blood transfusion provided by a golden eagle donor - also a recovering patient . The great horned owl is one of the most common North American owl species and can be found inhabiting just about any semi-open environment: deserts, wetlands, forests, grasslands, backyards, and even large cities. Despite the species’ sexual dimorphism, the smaller male has a larger voice box and deeper voice than the female - pairs occasionally call together with an audible difference in tone. This powerful predator has the most varied diet of any North American raptor and is capable of hunting large prey items, including other raptors such as ospreys and peregrine falcons. The great horned owl is so powerful, that once closed its talons required a force of thirteen kilograms to open. Frank is a muskrat who was brought to WEAMS after a WCVM veterinary technician witnessed him being struck by a vehicle. Fortunately Frank’s only injury was a laceration on his tail, which healed terrifically after minor surgical repair. Often mistaken for a beaver, as its preferred habitats is identical, the muskrat (Ondatra zibethicus) is essentially a large field mouse perfectly adapted for life in and around the water. Its specially evolved teeth protrude in front of its cheeks - this allows its lips to close behind the teeth, allowing the muskrat to chew on soft plant matter while underwater without receiving a mouth full of water. The muskrat is able to find food during winter under a metre of snow and ice, in ice-cold water and in total darkness - not bad for a aquatic field mouse. Their most preferred plant is the cattail, however, they also feed upon bulrushes, horsetails and pondweeds. Wawa the Canada goose was found in distress on a highway, presumably having been struck by a vehicle. He was diagnosed with a fracture of his right ulna (a bone in the wing) and was subsequently placed under the care of WEAMS to rest and allow his wing to heal, before being released in time for migration. It may be hard to believe, but at one point the Canada goose was considered a threatened species. Today population management programs keep their numbers in check - as they can be very detrimental to crops. There are eleven confirmed different "races" of Canada goose, ranging in size and colouration pattern. Canada geese (not "Canadian" geese) have an average life span of twenty four years and over those twenty four years, a single goose creates roughly 1,088 kilograms of excrement! Archie is a male barred owl who was found in distress and unable to fly. When admitted to the WCVM Veterinary Medical Centre he was incredibly weak, significantly underweight, and showed additional symptoms also consistent with sepsis. Archie was placed in the care of WEAMS where he received antibiotics treatment and supportive care. The barred owl lives a rather sedentary life - they don’t migrate nor do they disperse very far either. In fact, one study involving 150 banded owls revealed that upon being re-sighted, only six individuals had moved further than ten kilometres. Despite their home body nature, the barred owl has begun extending their range into the Pacific Northwest, where they’re displacing and even hybridizing with the critically endangered spotted owl. Buteo, a male red-tailed hawk, was discovered near St. Brieux, Saskatchewan unable to fly and walking abnormally. Radiographs revealed he had fractures of his coracoid (a bone in the shoulder) and pelvis. After receiving necessary treatment while under the care of WEAMS, Buteo made a full recovery and was released back to the wild. The red-tailed hawk is considered the most common hawk species inhabiting North America and isn’t difficult to spot - slowly circling over open fields or perched atop telephones poles alongside roadways. Their plumage varies considerably between different regions: the Harlan’s race, typically found in Alaska and northwest Canada, is completely dark and the Krider’s race, common to the Great Plains, is pale with a faded-pink tail. The red-tailed hawk commonly hunts small mammals such as voles, mice, ground squirrels and rabbits - and may occasionally prey upon other birds, snakes and carrion. Benny, a male Swainson’s hawk, was struck by the side mirror of a vehicle and brought to the WCVM Veterinary Medical Centre by the driver of the involved vehicle. After being assessed, he was diagnosed with a fractured coracoid (a bone in the shoulder) and received rehabilitative care from WEAMS. After a short stay, Benny’s coracoid healed wonderfully and he was eventually released. The Swainson’s hawk is common sight across the Great Plains and can be found in open ranging environments such as prairies and deserts. During the winter months, they fly south for Argentine wintering grounds. It’s one of the farthest migrations of any North American raptor and they often travel in huge flocks of hundreds or thousands - the flocks are called kettles. Interestingly, when not providing for young, the Swainson’s hawk exclusively prey upon flighted insects, such as moths, grasshoppers and dragonflies - typically catching prey while in flight. During breeding season adults are very opportunistic, eating a wide variety of small mammals and even other birds. In an area close to Alberta, a significant percentage of the Swainson’s hawk’s diet consisted of burrowing owls. Found near North Battleford, this male Cooper’s hawk named Catcher was diagnosed with a fracture of his coracoid (a bone which makes part of the shoulder joint). His wing was wrapped and he was kept on cage-rest under the care of WEAMS until his coracoid healed and could be released. Easily one of the most talented avian pilots, the Cooper’s hawk navigates dense forest canopies with impressive speed in pursuit of a feathered meal. Although, the high speed lifestyle isn’t without its risks - a study of three hundred Cooper’s hawks showed twenty three percent had signs of healed fractures to bones in their chest, presumably from collisions with trees. Preying primarily on birds, small birds tend to be safer than medium-sized birds, such as mourning doves, starlings, robins and jays - who all frequently end up on the Cooper’s Hawk’s menu. 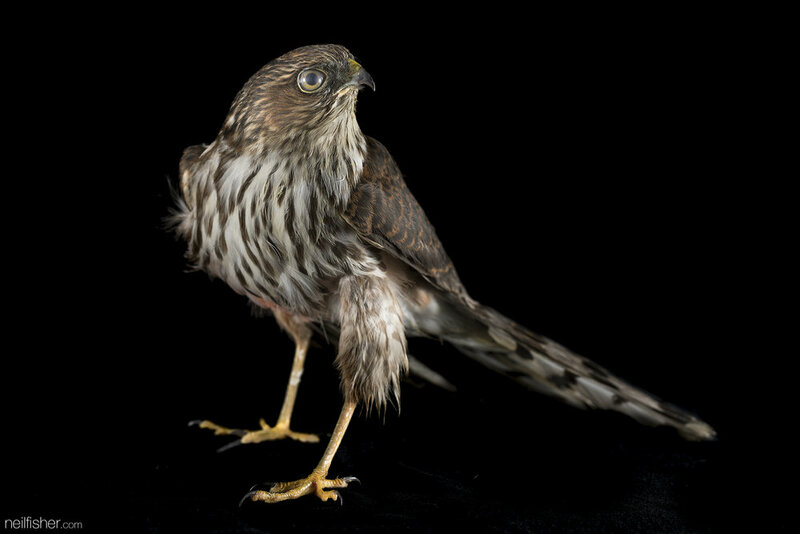 Deloras the sharp-shinned hawk was found near Gull Lake, Saskatchewan in distress and unable to fly. Upon admission to the WCVM Veterinary Medical Centre she was underweight and diagnosed with a fracture of her ulna (one of the bones in the wing). She was place in the care of WEAMS allowing her ulna to heal before being released. Female sharp-shinned hawks are roughly one-third larger than males, which subsequently allows them to hunt considerably larger prey items. As nestlings, the hawks feed first upon small prey delivered by their father and transition as they develop to larger prey caught by their mother. Before handing over an entire meal to their partner or nestlings, adult sharp-shinned hawks will usually remove and eat the head. These miniature hawks have talons not unlike that of a cat’s claw and will use their elongated toes impale and immobilize prey. Gerald, a male Japanese quail, was discovered in a citizen’s yard after presumably being attacked by a dog. He was kept under the care of WEAMS while receiving treatment for multiple puncture wounds and made an excellent recovery. Native to East Asia and Russia, the Japanese quail is a ground-dwelling species typically inhabiting environments with dense vegetation and thick undergrowth. They feed on a variety of grass seeds, insects, insect larvae and other small invertebrates. First domesticated in Japan during the 12th century, these birds are now commonly reared for their eggs by hobbyists and large-scale producers. Budd the American robin was brought to the WCVM Veterinary Medical Centre after colliding with a window and was diagnosed with a fractured ulna (a bone of the forearm). He received a special bandage to immobilize the fracture along with continued care from WEAMS. The American robin can produce three successful broods in one year, although only forty per cent of nests successfully generate young. Of fledged young, barely twenty five per cent survive past November and of all alive American robins only half will live another year. Regardless of the fact a lucky robin may reach fourteen years of age, the whole population turns over roughly every six years. Basically, it’s a tough life for a robin. Borneo is a merlin (a small species of falcon) who was discovered in distress on a citizen’s deck and thereafter brought to the WCVM Veterinary Medical Centre. On admission he was bleeding, displayed evidence of blunt trauma and showed inflammation on bloodwork. He was treated with anti-inflammatory pain medication as well as antibiotics and has made an excellent recovery. Weighing in at an average two hundred grams and standing no more than thirty centimetres, the Merlin isn’t exactly a large bird of prey. Their name is derived from the old French name for the species - esmerillon. These resourceful birds don’t build their own nests, and instead take over abandoned nests of other raptors and corvids. Medieval European noblewomen would use merlins for the sport hunting of skylarks - Catherine the Great and Mary Queen of Scots were both notable merlin hunters. They are skilled aerial hunters, preying mostly upon other birds caught in midair and will typically specialize in hunting one or two abundant species.